The Reed Relay based Float Switches are used in Automobiles and even corrosive and volatile fluids. This can also be used to indicate level of water or operate pumps. 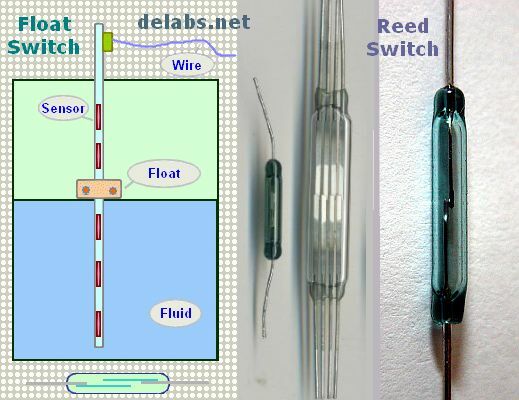 The reeds are hermetically sealed in glass, Like the Incandescent bulb. The signal switched by reed also should be a few mA or even uA. This makes is safe in Volatile fluids, where sparking can cause fires. Reed Relay. It was invented by Dr. W. B. Ellwood at Bell Labs in 1936. Contacts are in a sealed glass tube filled with inert gas like in a bulb, so they do not corrode. It is faster than regular relays and as no spring is used it has a longer mechanical life. The two contacts are ferromagnetic blades plated with rhodium. When you take a magnet close by, the contacts touch each other. You can also put the reed in a coil, then when you energize the coil the reed operates. Used in telecommunication.OKI is one manufacturer of this type of component.